After Everton managed to recover from their inconsistent league form to beat Man City 2-1 in the Capital One Cup semi-final first leg earlier this month, everyone’s talking about the prospect of an all-Merseyside final against rivals Liverpool. First, though, the Toffees have to travel to the Etihad Stadium on 27th January for what will likely be an extremely tough game. The attacking potential of both teams will make this a fascinating match for fans everywhere. Man City have the best home record in the Premier League, but this is offset by their away record ranking at eighth position after 20 games. During the Capital One Cup semi-final, Everton held 47% of possession, but managed to create seven shots on target compared to only four for City. The Toffees even had goals disallowed from John Stones and Romelu Lukaku before Ramiro Funes Mori at last gave Everton the lead just before halftime. 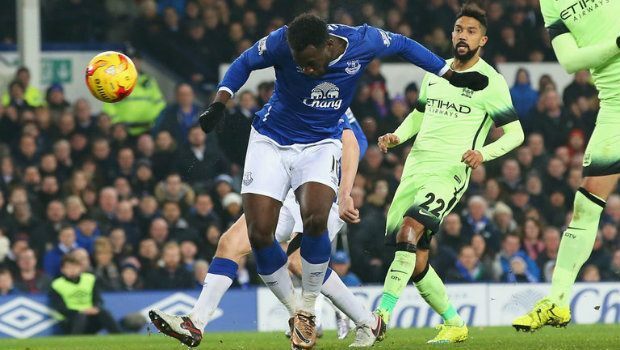 City did pull a goal back through Jesús Navas at 76 minutes, but an on-form Lukaku restored Everton’s advantage just two minutes later. Man City have endured a difficult season without club captain, Vincent Kompany, who continues to miss games due to a calf injury. New signing Nicolás Otamendi has had some moments of greatness at centre-back, while 24-year-old Frenchman Eliaquim Mangala was subbed off for 35-year-old Martín Demichelis after 45 minutes on Saturday. Everton’s Premier League tally of 36 goals in 20 games ranked them third in the league for scoring, while their 29 goals conceded placed them joint-16th with Chelsea. Many of those goals can be attributed to the absence of experienced defender Phil Jagielka, who needs to rebuild his match fitness after recovering from a knee injury. Last summer, manager Roberto Martínez signed Ramiro Funes Mori, who joined 21-year-old John Stones in central defence for much of the season. This partnership may eventually prove effective, though for now, Jagielka’s experience will be needed if Everton are to overcome a City attack from talents such as Sergio Agüero, David Silva, Kevin De Bruyne, and Yaya Touré. Martínez can’t afford for his side to sit back and invite any extra pressure, as Man City are not short of world-class attackers capable of scoring inside or outside the box. Everton will need to rely on their attacking strength, and ensure that striker Lukaku gets support. Man City are justifiable favourites to win this season based on their home form to date. Man City to win at home is available at 1/2 with Paddy Power, which also foresees Everton as unlikely winners at 9/2, with a draw in 90 minutes at 10/3. Cup competitions often throw up uncertain results, which is why backing the correct qualifier can be a wiser move than trying to pick a result in 90 minutes. Backing Man City to qualify for the final is available at the generous odds of 4/6, with Everton priced at 11/10. City also appear to be the stronger option because of their away goal in the first leg. This goal means that City only need to win 1-0 to make the final; however, both teams share a strong attack with weakness at the back. So a defensive 1-0 encounter could be unlikely with each side eager to reach the final. Over 2.5 goals is available at 1/2 with Betfred Sports, while both teams to score is 8/13.